The use of high quality efficient LED signs for various purposes is a great way of both saving your money and allowing you to become more recognisable on the market. For instance, you can use LED lighting solutions for both widely meant advertisement campaigns, but also for various issues related to both industrial, commercial and domestic needs and purposes. It is now increasingly more popular and common to use LED lighting solutions as a house interior lighting sources, extensive outdoor lighting systems for both underwater (LED diods can be made water-proof), garden and patio lighting, etc.. They can also be used as a valuable source of street lighting, car lighting, or traffic lights. There is also a wide range of applicable solutions for LEDs in both commercial and industrial branches. For example, they can be used as a direct light providing means while working and operating in mine tunnels, or any other underground facilities that require a constant and steady light source. The use of traditional lighting methods including fluorescent and halogen lights is extremely expensive in terms of energy consumption. There are several issues that should be considered when deciding on a particular type of lighting source. The fluorescent banners and signs that are still in use in many popular and commonly visited places that offer a great spot for your advertisement campaign. Using the traditional fluorescent or halogen source of light makes your display both ineffective and poorly visible. The fluorescent billboards are more prone to fast aging whenever subjected to a frequent switching on and off. It has to do withe their cathode erosion each time the light is switched on. After a prolonged switch on and off mode, their electron-emitting surface is burned up and the light has not enough voltage to start up. LED lighting doids are also perfect for various technical solutions such as, for example, control lights, emergency lights, LED displays and text conveyors, etc.. Since the traditional lighting methods such as fluorescent bulbs do not have any available wireless network connection for choosing the relevant information to be displayed they have to be organised in a fixed pattern and what is worse, the design cannot be changed instantly. 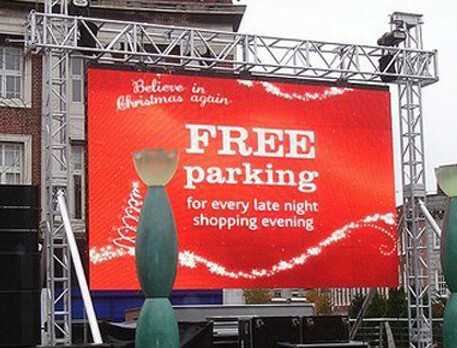 The effects resulting from choosing the eco LED displays and signs as an advertising tool for your needs will be vastly bigger than in case of the traditional halogen or fluorescent billboards.